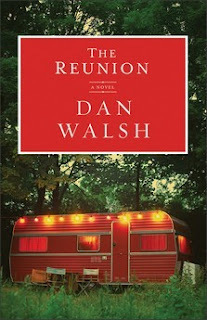 I have been blessed to read a couple novels by Dan Walsh and one thing I have consistently found in his work, is the depth at which we get to explore his main character. He is diligent in creating a character that we can get to know and care for. I love that in a novel. There are secondary characters of course, some of which we get more of a glimpse into their lives than others, but his main character is always well known by the reader by the time you finish the book. The reunion is about 3 Vietnam Vets who meet together each year to celebrate their survival of the war, which wouldn't have happened without Aaron Miller. The 3 vets; Tex, Hammer and Redman, now grown with families and grandchildren, never really shared with Aaron their thanks for his rescueing them from death one night out in the Vietnam jungle. They had actually up till them not given Aaron much thought, not even really in any kind of friendship with him at that point, yet Aaron jumped in there to help, being injured himself in the action. After leaving 'Nam Aaron tried to pull it together for his wife and 2 children, Steve and Karen, but the memories and horror of war drove him to drink and drugs. Finally he found Jesus and was cleansed from that, but too late for his wife to allow him access into his children's lives. They grew up not knowing where there Dad even was. Aaron, humble and discreet worked as a maintenance man for a trailer park, continuing to put others before him. No family, no real friends, he finds solace in God. Tex, or John seeks out to find Aaron so that they can properly thank him, and asks reporter Dave to find him. God orchestrates the reunion His way, and what was lost was able to be found. I cried several times in this story as it felt so real, and I felt such compassion for these Vets, Aaron and his daughter Karen. I was deeply moved with this story of forgiveness and sacrifice.